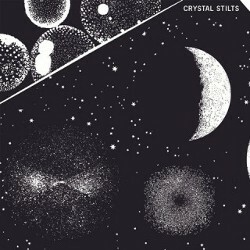 With reverb muddled vocals‚ liberal borrowing from the ghosts of rock & roll past‚ and a name culled from the random indie band name generator‚ it should be hard for Crystal Stilts to distinguish themselves from their peers. But on In Love With Oblivion‚ the Stilts have collected sounds from legends of the 60s-80s and created a surprisingly fresh‚ somewhat original sound to call their own. In terms of starting off with a bang‚ Oblivion opens with a shotgun blast. "Sycamore Tree" is a rockabilly room shaker that brilliantly introduces (or reacquaints) listeners to Brad Hargett's baritone/monotone vocals‚ and the lush yet economical sound of his excellent backing band. Though Hargett's lyrical skill is always hidden behind a thick wall of reverb‚ his voice deftly serves as a rhythm instrument‚ adding another layer of sound to the Stilt's many infectious guitar and keyboard riffs. The frantic energy of "Sycamore Tree" makes the laidback parts of Oblivion sound like audio aftershock by comparison‚ but the Stilts' aptitude for making every guitar strum‚ cymbal crash and keyboard note count makes their slower fare sound equally crisp and cohesive. The band's "less is more" sensibilities create Oblivion's best moments‚ but they're glaringly absent on "Alien Rivers‚" an early album distraction that accomplishes less with seven minutes than most Stilts songs do with three. The Stilts are clearly talented musicians who deserve the right to experiment‚ but "Alien Rivers'" quicksand pace and Hargett's spoken word delivery do nothing to hold a casual listener's interest. Speaking of Hargett's vocals‚ it would be much easier for casual listeners to convert to passionate fans if they could actually comprehend what the hell he's hiding underneath all that echoing. Sure Hargett sounds cool‚ and he's good at conveying moods in his delivery. But for me‚ the only one whose opinion matters in this dictatorial fantasy land of a review‚ lyrics are what make me love musicians long after their latest catchy hook has vacated my brain. Broken relationship songs like "Silver Sun" and "Shake The Shackles" hint that Hargett has a vulnerable side waiting restlessly to be shared‚ but other tracks like "Blood Barons" have such indecipherable lyrics that he could be singing about anything. In Love With Oblivion is a good album that hints at greatness‚ but fails to narrow the distance between the band and its audience. But even if you never relate to‚ or even figure out what Brad Hargett is saying‚ he'll still sound like a badass when he echoes it through your speakers.